Click here for the full performance calendar. If you would like more information about the group or are interested in arranging a performance, contact us via email. Before contacting us, please review our performance considerations. Before we can agree to a performance, we need information about the event (particularly the size of the stage) and your requirements (date, time, budget). Please provide this information in your initial contact with us. Enzian Schuhplattler performs at schools, festivals, Oktoberfests, and private functions. Contact us to schedule a performance for your group or function! The following Schuhplattler and folk dances are included in Enzian Schuhplattler's repertoire. We are fun! Audiences love us! 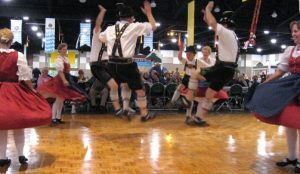 Enzian Schuhplattler is the only culturally authentic Bavarian dance group in the state of Washington. We buy our costumes from Bavaria, and they are identical to those worn by Schuhplattler groups there. Our dances are traditional German and Austrian dances, identical to those done in Bavaria. Our unique blend of dances and music adds an entertaining and upbeat element to your event. We have a few children who perform with us at events suitable for children. We perform with traditional Bavarian instruments (button accordion, alphorn) and unusual percussion instruments (spoons, whips, Teufelsgeige). We have been in existence since 1965, and the majority of our members have German or Austrian heritage. Many of our members have visited or lived in Germany and speak German. Our dancers are not paid, and they are all volunteers. We reimburse some travel expenses when the club treasury can afford it, but the reimbursement does not usually cover the full expenses that members incur. In addition, members purchase their own costumes (generally $800-$1000 per person, per costume). What our members receive in return is the fun of dancing in front of an audience, meeting new people, and group camaraderie. Therefore, it is important to us that we have fun at an event. In addition to the performance for which you pay us, we generally stay at your event, in costume, dancing and adding color and excitement to the event. We appreciate it when you provide food and/or beverages as part of our recompense for attending your event. Many of our dances are done in a circle of couples, with the men on the inside of the circle plattling and the women on the outside of the circle, spinning. Because of that, our dances take up what may seem to be a large amount of space. Also, the men do a lot of jumping, which means that a sturdy floor is essential. The women do a lot of spinning, which requires a smooth, level floor. We do have some dances that can be adapted to smaller spaces, and some of our dances can be done with only 2-3 couples, which decreases the amount of space required. Others of our dances cannot be done with fewer than 4 couples, or in some cases 6 or 8 couples. If you request multiple sets and can only offer a small performance space, we may not accept the performance. At most of our performances, we will have one or two musicians; one plays the button accordion and the other one plays baritone and alphorn. We will need a microphone for announcements and the appropriate connections for the pickups in the accordion and baritone. When our musicians are not available, we dance to recorded music on our laptop, or CD. Our dancing is very strenuous, especially for the men. For that reason, we generally dance no longer than 30 minutes at a time. We can do three or four 30-minute sets in one day, as long as there is a minimum of 1 1/2 hours rest time between the sets. If you would like a single performance that is 45 minutes to an hour long, we can accommodate that by interspersing our dances with discussions of our costume, history of the dances, and club information; audience participation dances; and musical numbers (alphorn, accordion, Teufelsgeige, and spoons). We can and do adapt to many kinds of surfaces and situations, and many sizes of dance floors. However, we may refuse a performance if there is an inadequate dance floor for our needs. We will not dance on cement, or tile over cement. The safety of our performers is paramount. Smooth wooden dance surface, preferably a permanent wooden dance floor. (If a stage must be assembled for the event, please make sure that the pieces are securely screwed together (not nailed) and that there are no raised edges or screws on the floor surface.) Please, no tape or other substances on the dance floor! 20' x 20' or larger dance floor/stage. (If the stage is raised off the floor, it should be larger, if possible, or have railings at least on the sides and back.) The acceptable size would be at least 24' square, preferably larger. Square, unobstructed dance floor. (That is, no chairs, speakers, microphones, cords, or other obstructions on the dance floor.) Since most of our dances are done in a circle, a square floor is preferable to a rectangular one. High ceiling (12 feet or more). Our men jump and use sweeping overhead arm movements during some dances. Low ceilings, and low-hanging decorations, are a hazard. To add to our performance, we may bring a number of props, our banner or Tafel (wooden sign), alphorn, and sometimes (if needed), our sound system. Several of our dances depict typical occupations in the 1800s, like woodchopping and mining, and we have props (logs and axes, and chisels and lanterns, for example) appropriate to those occupations. These are some of our most entertaining dances, but are not appropriate for some venues. Sound system with one microphone and two plug-ins for pickups. (We can provide our own sound system, if a sound system is not available). Storage area for props, both before dancing and during our performance(s). Easy parking access for those bringing props. We do have a number of heavy and bulky props that we use in some of our dances. Dressing room, particularly if the event is outside the Seattle metropolitan area. To assist you in publicizing our participation at your event, we have a media kit available. The electronic version is available on our Web site, or we can send you a printed copy of the materials. We also include your event on our Web site on the list of our performances.